Holy Relics - Holy and Life Giving Cross, Orthodox Christian Parish, Lancaster, U.K. Soul and matter are created by God, and God by His incarnation bestowed further Divine glory in Christ so that we too may become like God. The holiness of the saints, both their souls and bodies, derives from their virtuous lives which were lived in harmony and synergy with this Divine Grace. Through the indwelling presence of the Holy Spirit lives are transformed; the very bones of saints themselves are containers of grace and filled with glorification bringing healing, miracles and the odour of sanctity and myron to the faithful who venerate them as a sign of their faith in the Incarnation and Resurrection of Christ. Saint Ephraim the Syrian relates the following concerning holy relics: "Even after death they act as if alive, healing the sick, expelling demons, and by the power of the Lord rejecting every evil influence of the demons. This is because the miraculous grace of the Holy Spirit is always present in the holy relics." The Word becoming flesh lies at the very heart of our pious veneration of holy relics without which in the Antimensia no Holy Liturgy can be served. 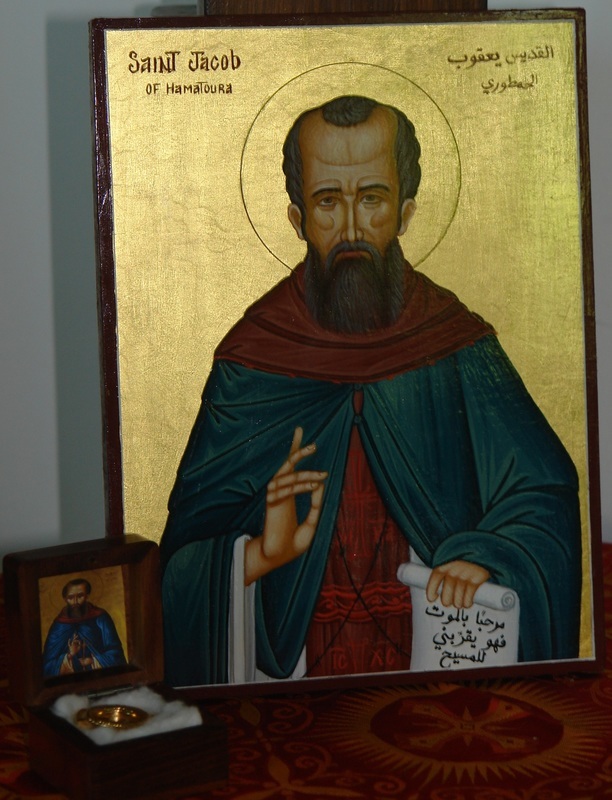 St. Nikolaos Planas fell asleep in the Lord on the 2nd March. We are blessed at Holy Cross in having some fragments of the bones of St. (Papa) Nikolaos Planas of Athens. These are contained in a larger and smaller reliquary, set in wax and were given to us from a lady in Athens who had association with a Monastery with which the Saint had association. The smaller of the two relics often emits a beautiful fragrance. Having escaped from the traps of the deceiver, most holy (one), thou didst go through life unerringly, O our father, blessed Nicholas Planas, having received celestial gifts, with vigils and fasts you serve thy Lord in holiness. Thou who supplicates extensively, Naxian priest, intercede so that the divine mercy is also bestowed upon us. St. Papoulakis fell asleep in the Lord in the 2nd of March. 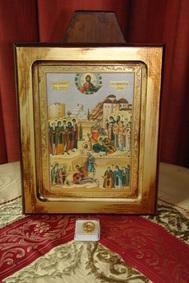 We are double blessed in possessing a relic of St. Joachim of Vatopaedi and Ithaca. The relic was given to us by Pater Theodosios Dendrinos of Ithaca as a holy gift to our Holy Synodia of the Holy and Life Giving Cross for translating the book of the life of St. Joachim into English. 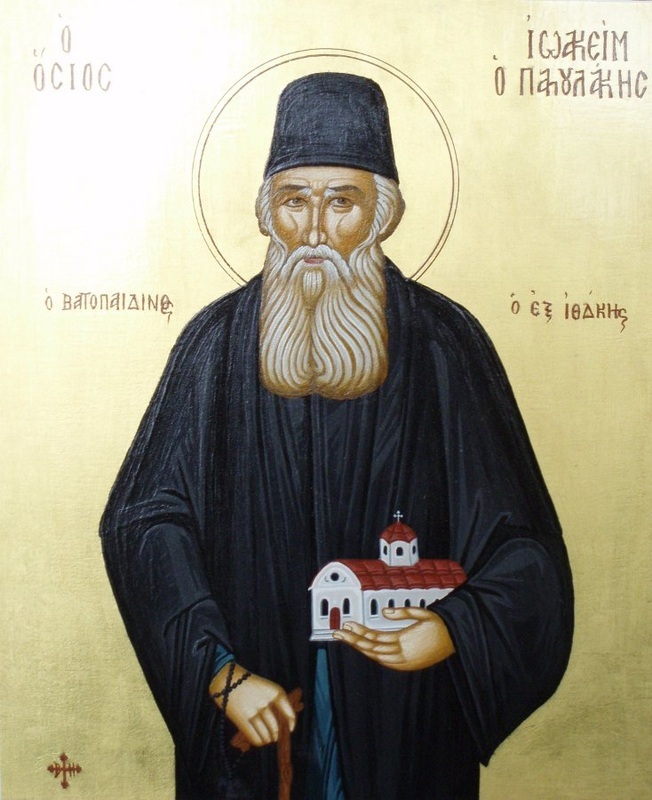 Icon of St. Joachim of Ithaca and Vatopaedi. The Saint is also known by the affectionate term "Papoulakis". Ως του Κυρίου αγιόλεκτοι άρνες, εξορμημένοι εκ χωρών διαφόρων, τη ποίμνη συνεδράμετε του Παντοκράτορος, όθεν θανατούμενοι απηνεία βαρβάρων, χαίροντες εξήλθετε εις ουράνιον μάνδραν, καθάπερ όσιοι και μάρτυρες Χριστού εκδυσωπούντες υπέρ των ψυχών υμών. ​The Icon of St Jacob of Hamatoura and his holy relics were sent to us by Hegoumenos (i.e. Abbot) Archimandrite Panteleimon from the Monastery of the Mother of God at Hamatoura, Lebanon. St Jacob's feast day is the 13th of October. The Parish also has secondary relics with stones from the Isle of Iona where St. Columba launched his mission, from the cell of St. Herbert on St. Herbert’s Island and from the grave of Elder Arsenios from Prislop Monastery in Romania. We are also blessed to have two threads of the cassock of St John Maximovitch of Shanghai and San Francisco. Reliquaries donated by the families Michelis and Anastasios Papadopoulos.